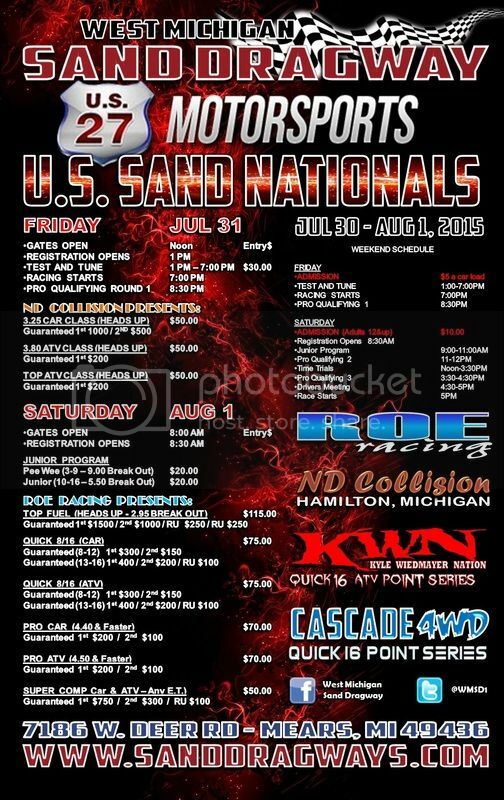 July 31-August 1st the US27 Motorsports Sand Nationals! There are some exciting additions to the program this year including three added classes Friday night! Any car configuration heads up you can't run faster then 3.25 seconds. The 3.80 Heads up ATV class is back- an extremely awesome class added to the Outlaw program by Richards Auto will be featured. A new class for the ATV racers on Friday night will be TOP ATV- This will be a straight heads up fastest ATV wins. On Saturday it will be Roe Racing sponsoring a HUGE Top Fuel payout. The field will be one of the biggest to date and you wont want to miss it! US27 is pulling out all the stops this will be an awesome event hope to see everyone there! Huge thanks to them ND Collision and Roe Racing for all of this support for the 2015 U.S. Sand Nationals!